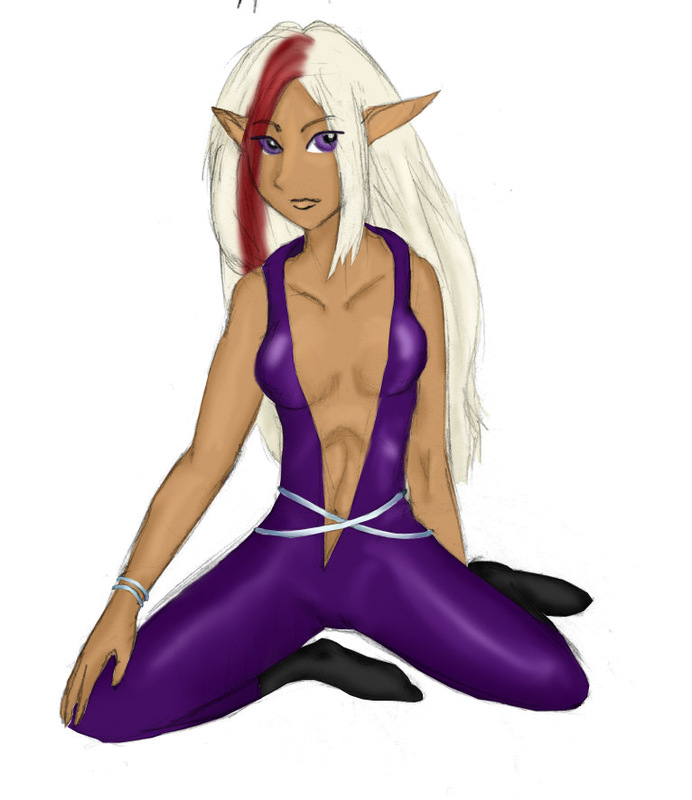 Race: Half-elf/Half-drow (her mother was half wood elf, half human, and her father was half dark elf, half human). 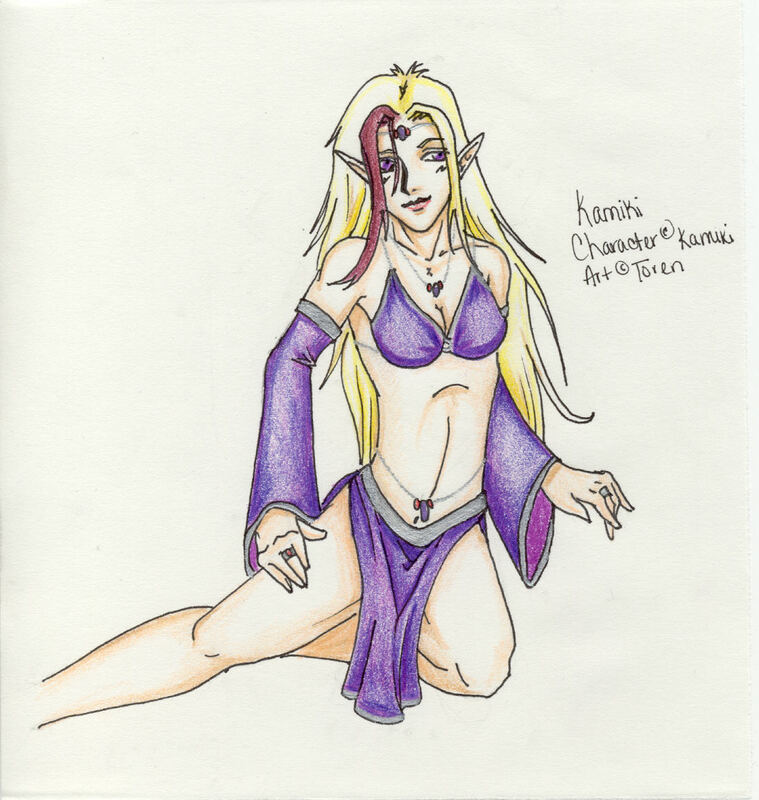 Appearance: Kamiki is truly unique amoung most elves and humans. 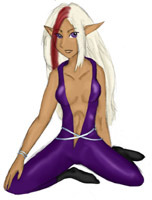 Her elven blood gives her her sharp features, long ears, coloration, and otherworldly beauty. 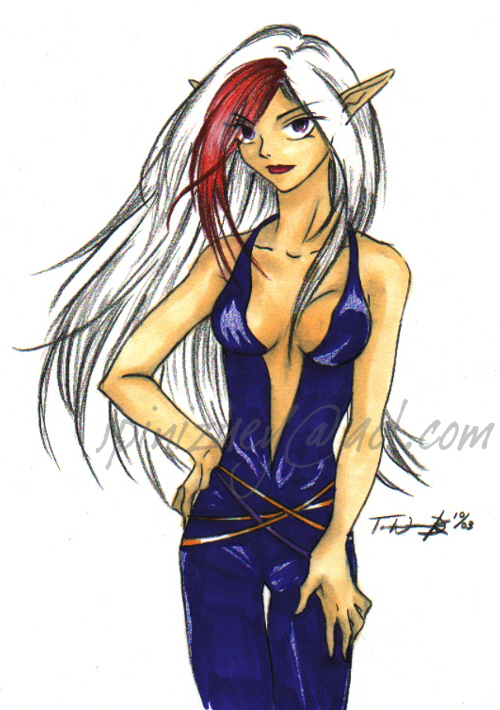 The human blood in her give her her curvy figure rarely seen in elves. Her skin is the color of light mocha. Her eyes are vibrant violet and slightly almond shaped. Her hair is a very light shade of blonde: indoors and in shade it looks light straw colored, outside in direct sun it appears almost white. She has a deep burgundy strip of hair over her right eye. 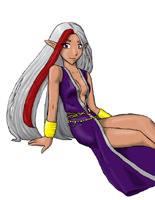 Her typical clothing is that of purple robes with platinum jewelry, or, if the need be, leather traveling clothes (elven druid's leather to be precise). She usually wears her hair down, however will braid it back if practical, or put it up in formal situations. Her hair is shorter in front, so her burgundy strip is usually visible as it tends to slip out of braids or other hair styles (so she's given up trying in most cases). History: Kamiki was born into a class of women called the Cha'krai. Cha'krai are a hybrid of a geisha, a concubine, and a mistress. They are trained from a young age to be the perfect companion for a man. As children, they are taught to sing, dance, and write calligraphy. They are trained in fashion sense, and conversation. As young teens, they are taught acupuncture, massage, and oil-blending (for aroma therapy). And, once they hit 14, they are trained in the arts of the kama sutra and other sexual pleasures. When they are mature at 17, they are literally molded into most men's fantasies. They are beautiful and perfectly groomed. Polite, educated, and witty... they are able to please a man in any way from a pleasant conversation on politics to carnal pleasures of the bedroom. They are, however, only property, and are sold and traded and such. However, Cha'krai are a very expensive commodity- reserved only for the very rich. Despite their slave-by-definition status, a man usually treasures his cha'krai like a cross between an Italian sports car and a very dear pet. They usually have free reign over their master's property, and pampered with gifts and luxuries. A man can not marry a cha'krai, however, and it is viewed in Kamiki's society as inappropriate. Privileged men usually had a wife and cha'krai. Wife-women were more practical than the cha'krai. They apt in cooking, sewing, and bearing children. Woman who are not banded as cha'krai are near-equals to men in terms of the law. They can own property, engage in polictics, and are not "owned" by their husbands - although it's social normalcy to serve your husband. Despite Kamiki's mixed heritage - her beauty and exotic looks quickly got her recruited to be a cha'krai. Even tho they are slaves in the eye of the law- the position of a cha'krai was often a envied one. Cha'krai women are educated and well-fed, eventually entering into a life of privilege. Kamiki was recruited into the program at such a young age - barely 4 years old - that she never knew of a better life. She was sold to a Lord named Rakinin. Rakinin wasn't a cruel master, but a demanding one when it came to bedroom. Kamiki was aware that her duties as a slave would include sexual ones- though she was disappointed that her master seemed to have little interest in her array of other talents. But, she got quickly used to the lifestyle. However, tension quickly began to build between Kamiki and Rakinin's wife, Marissa. Marissa was a nobleman's daughter Rakinin married a few years before being able to afford his cha'krai. She was beautiful in her own right, with thick chestnut hair and hazel eyes. 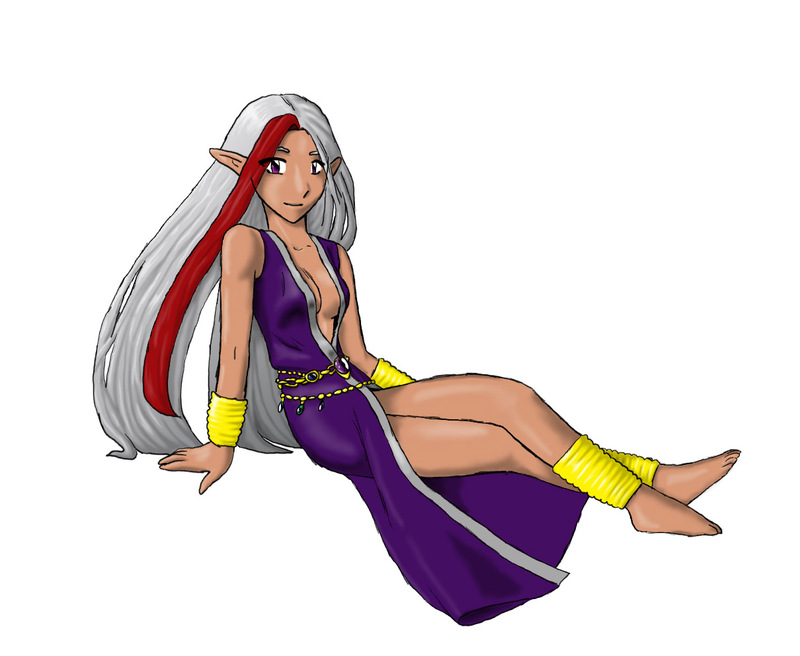 Brown hair was uncommon in the Noble House, which was made mostly of fair-skinned high elves. However, Rakinin found Marissa to be horribly boring, and tensions between Kamiki and Marissa rose quickly as Marissa tried (and failed) to win over the affections of her husband. At first, Kamiki found some kind of selfish confidence in that fact that Rakinin was easily more entertained by Kamiki's talents than the labours of his wife. However, as the years creeped by, Kamiki got more and more guilt-ridden as she was exposed to Marissa more. Marissa was loyal and good at heart- but nothing she did impressed her husband. To view all art of Kamiki please click here.